GitHub - guillemontecinos/itp_fall_2018_animation: This repo contains all the code and assignments developed during the class Animation attended during the fall 2018 term at ITP, NYU. This repo contains all the code and assignments developed during the class Animation attended during the fall 2018 term at ITP, NYU. Want to be notified of new releases in guillemontecinos/itp_fall_2018_animation? 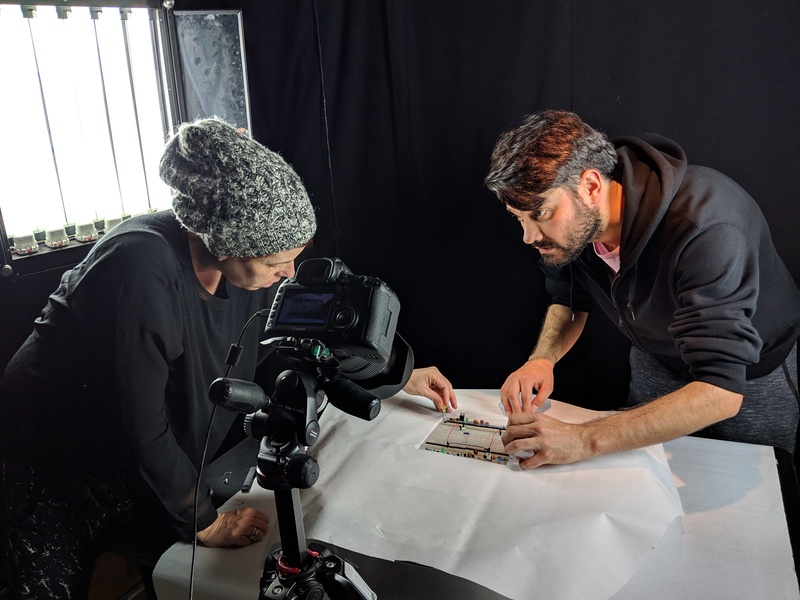 This document and the contents stored in this repo corresponds to the class of Animation with the teacher Marianne Petit, at NYU ITP taken during the 2018 Fall term. For the animation class first assignment we were committed to develop a motion animation, project in which I collaborated with Idit Barak and David Azar. The first question we asked ourselves was what story to tell?, which is a great question because it's never easy to start with a blank canvas. 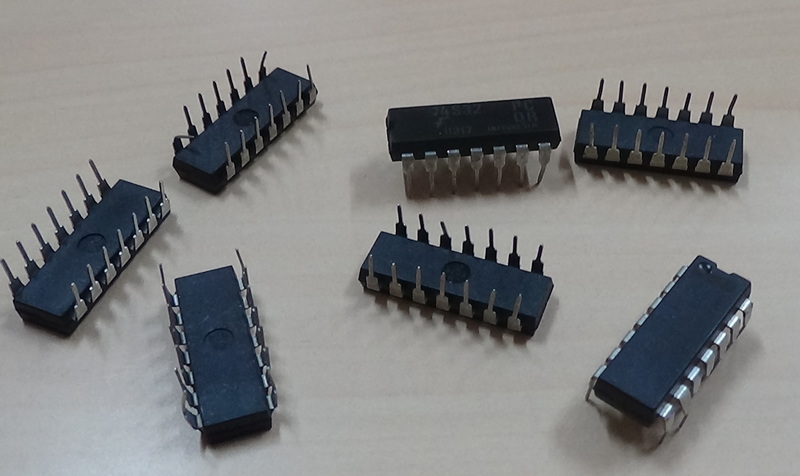 After a short brainstorming we realized we wanted to make a world where electronic elements came to life: capacitors as fat people, IC's as bugs and resistors as zombies, a whole world of fantastic creatures -that I've imagined since my time at Engineering School- but not a story to tell. 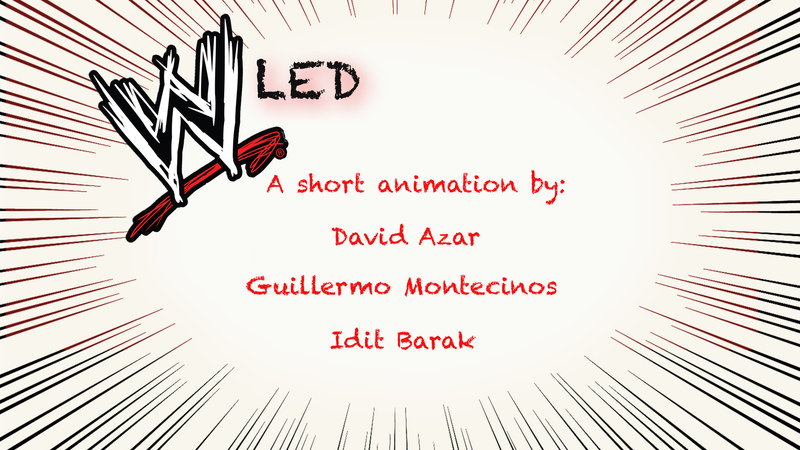 The story of a family of bugs became into a competition of electronic components which later became into the "Led Olympics": we wanted to recreate the olympic games with components but the time constraint -30 seconds of animation- gave us the answer: why not just LEDs wrestling?. So we made the LED's to be wrestlers and the breadborad to be the fight arena. 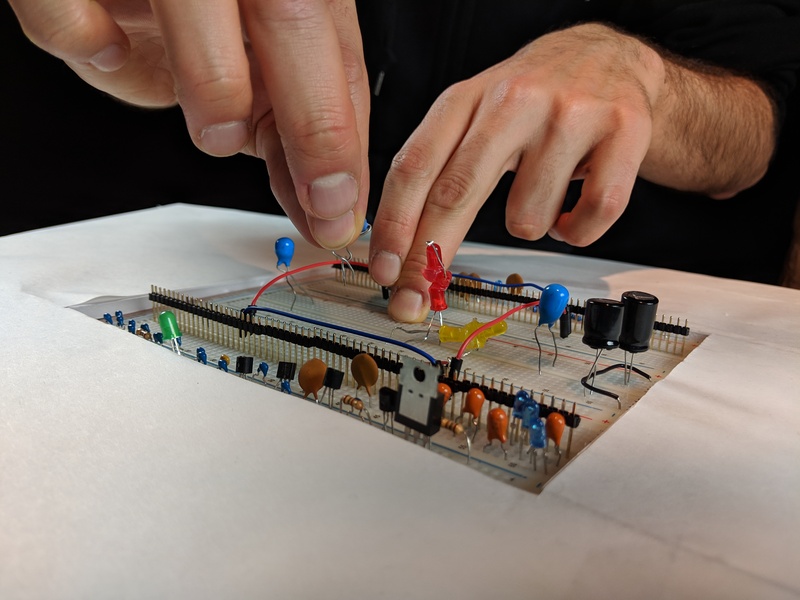 Apart from the LED's we made a resistor to be the referee, two capacitors to be the commentators and a bunch of other components to be the audience. The shoot took about 5 hours and we did it in one night. The post-shooting consisted in editing the video and adding sound to the crowd and the characters. We recorded gibberish sounds for the characters voices and used open sound effects for the crowd, the fight sounds and the boxing bell. The final result of this work can be seen following the next link. For week 2 we were committed to work in groups to develop a storyboard for a 1-3 minutes animation in AfterFX. For this I worked with Mingna Li and Nianqi Zhang. Thursday after class my group and I talked about developing a non-sense story in which characters have behaviors that they don't use to have in real life (is that non-sense enough? ), as Trump being kind or a flower growing up from a machine. We actually started with a flower, and that was all we had. 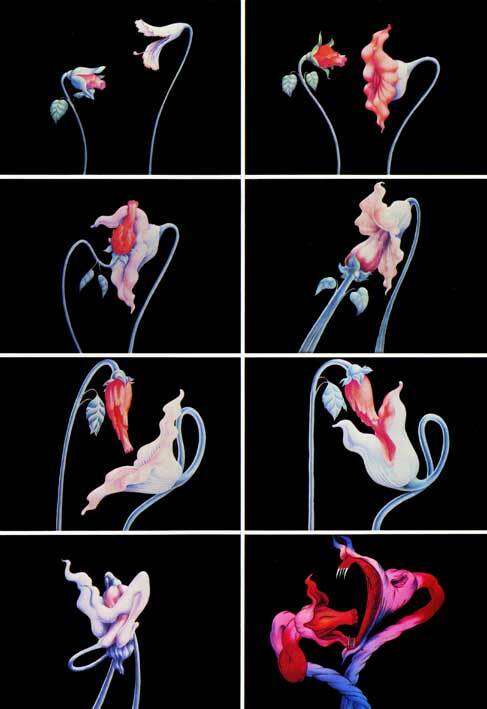 Our expectations were not to tell a story of a nice flower but to set it in a weird landscape or make it fight or to be rude, as the flowers of Pink Floyd's movie The Wall that represent passion and destruction. 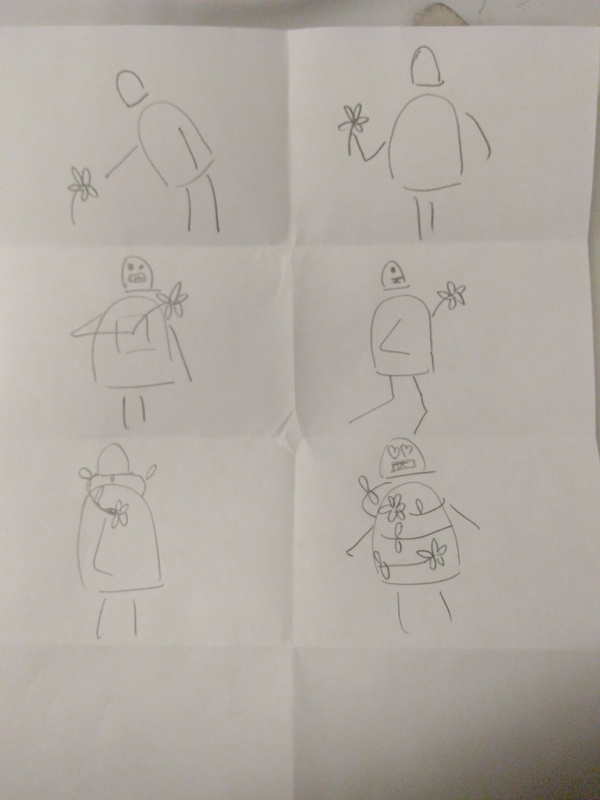 Then we talked about telling a futuristic story in which the flower can be involved. 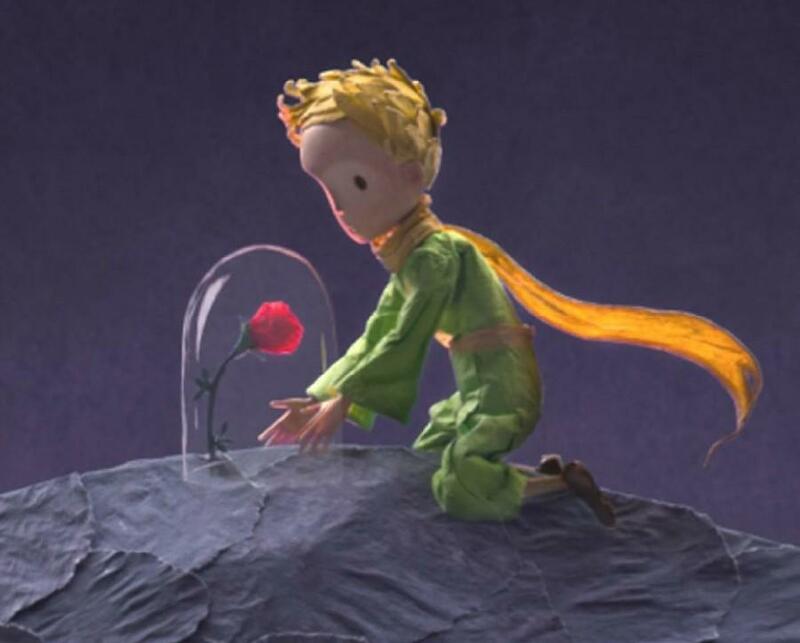 We thought that our flower could go to space, interact with robots and even we speculated that we could tell the alternative story of the Little Prince's flower. But finally we just decided to talk about a flower that grows up in a landfill full of trash. 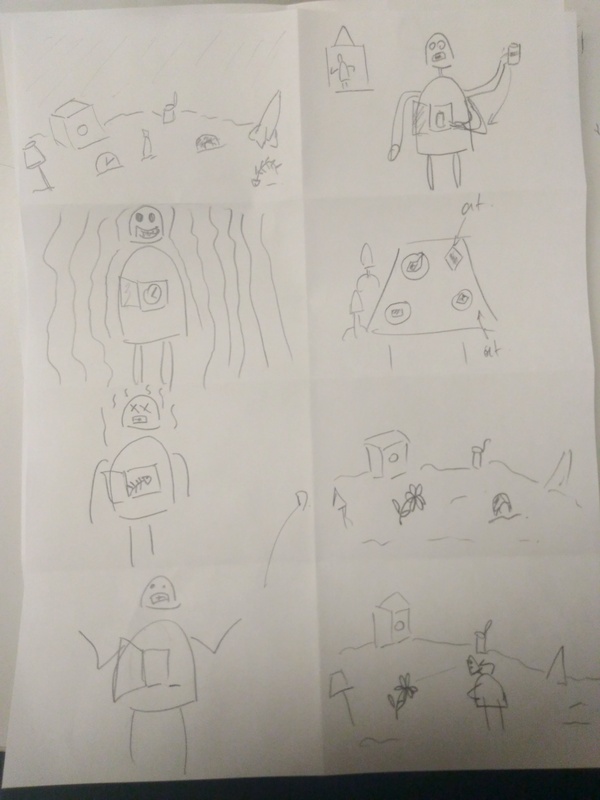 As we wanted to talk about non-sense and dystopic futures our brainstorming evolved into a robot story, where robots survived to a post-futuristic world where humans had disappeared. As they just survived, there were no energy or fuel to feed robots, so they evolved into a state in which each unity could take energy from different elements, as flowers take energy from the sunlight through photosynthesis. There are some robots that take energy from oil (oil-o-synthesis), other from Coke cans (coke-o-synthesis) and other from flowers -they don't do photosynthesis, they steal energy from flowers. The story starts in the empty landfill were the flower grows up, but the flower can be seen. After that other robots are shown feeding themselves by something-o-synthesis process with different elements a soda can, a clock and a decomposed fish. Then, a group of rich robots is shown eating human classic art -as Monet or van Gogh- in a fancy table. 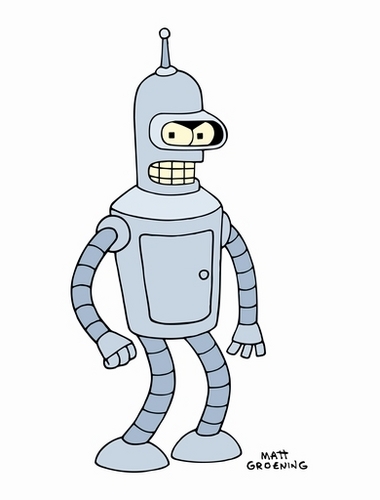 The main character -inspired in Bender Rodríguez from Futurama- is a poor robot that can't find anything to synthesize energy so he goes to a trash landfill -the parks from the future- where he finds the flower that grew up from trash. After looking at the flower he cuts it and puts it on his chest, stealing the flower's energy. 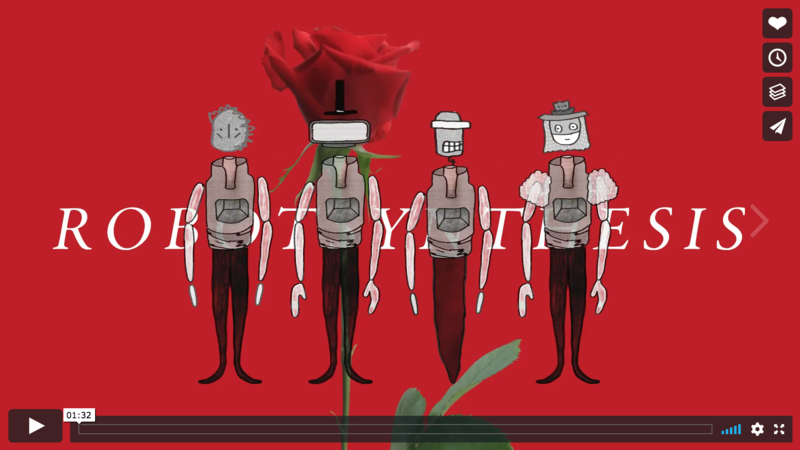 After that the flower and the robot come into a passional interaction represented by the flower growing up and turning into a vine around the robot. During the following weeks we were committed to work in the 2d animation from the storyboard and assets developed in week 2. 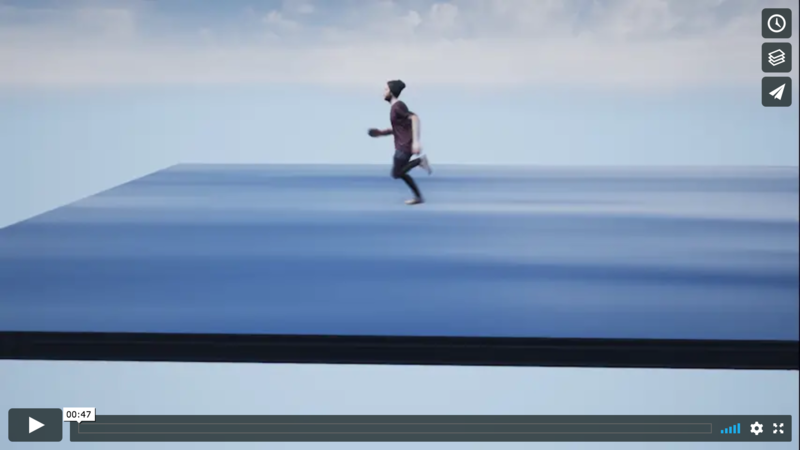 The animation was done using After Effects. In order to split the job we divided the story into scenes, so each of us had to animate two or at least three scenes. To make the work consistent, templates were built for the landfill scene and a color palette was chosen. After all of us finished our parts we met and put it all together using the software Adobe Premier. Regarding sound, open source effects and songs were used to create the sensation of being in a real world -excepting for the soundtrack of the movie Maniac which was used without permission, but since this is just an academic exercise it shouldn't represent an offense. For my particular duties in this project -which were the animation of the fancy robot eating a Monalisa and the poor robot being hungry I applied the technique of using a traveling camera to zoom in to the head of the fancy robot. Furthermore, for the built of the landfill landscape I used a 3D spatialization of the elements, and a shoot with a camera that pan the stage. 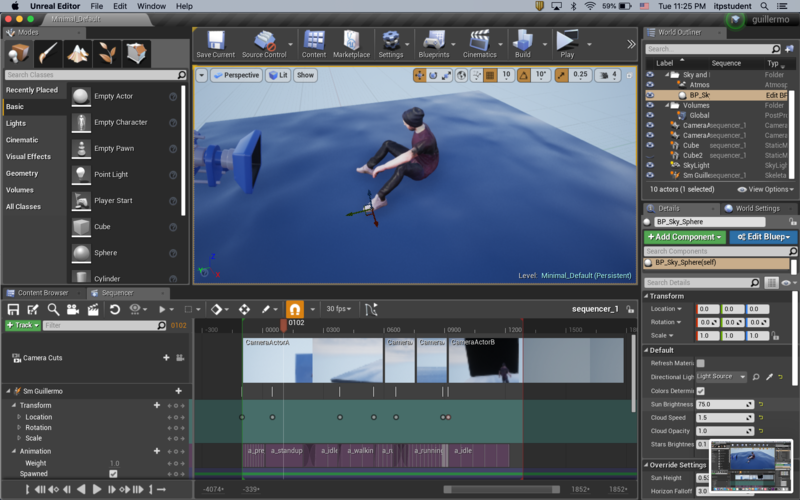 For the last part of the course we were introduced into 3D animations through the learning of Unreal Engine, a game development tool which also can be used for animation and sequencing purposes. We were committed to create our own character using the software Adobe Fuse and then animate it in the Adobe Mixamo platform. In this occasion I decided to explore my own body as a character by creating an avatar of myself. For that I was scanned by a third person using the itSeez3d platform and sensor, which provided an .obj file and the texture of my body. This model was auto-rigged and animated in Mixamo, a free platform provided by Adobe in which an .obj file can be fitted into a skeleton in which animations can be attached. Both the skeleton and the animations were imported to Unreal Engine, were the different animations were sequenced creating a story. My idea in this project was to represent the chaos, anxiety and burden under one can be subjected in stress situations as ITP. The storyboard consisted in an anxious dream in which my avatar appear from above a water square floating in heaven. The character stands up and looks around, surprised to be in an unrecognizable place, and starts to walk. As soon as he walks the surface grows under his steps, when he starts to run desperately. The end of the story comes when the character finds himself in front of a big wall which he can't overpass being trapped in the dreamlike world. The soundtrack of the animation is "The Small Print" of Muse (it was used without permission because of the academic purposes of the exercise) because is a song that evokes me anxiety and desperation.